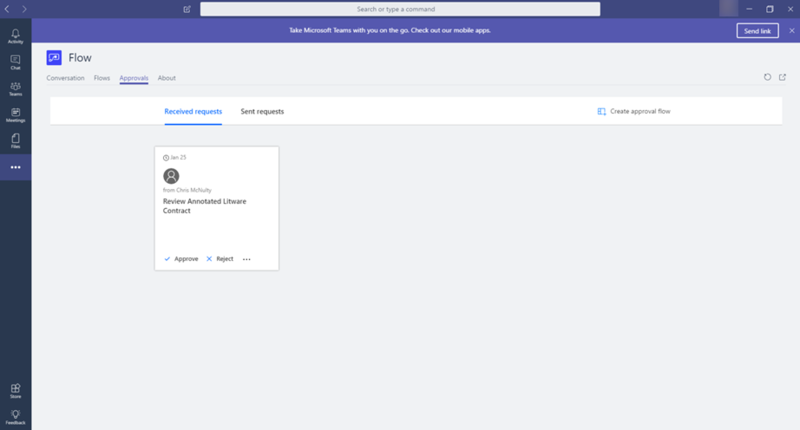 As part of Microsoft Teams’ recent apps updates, we’re pleased to announce the release of the Microsoft Flow integration in Teams. 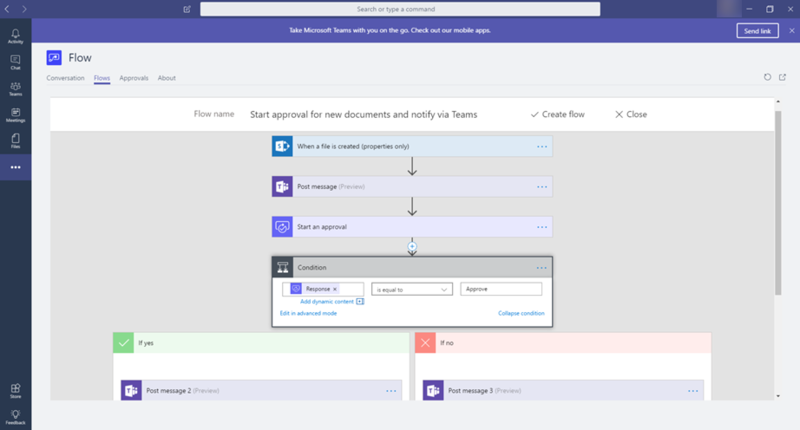 With this integration, right from within Teams, you can create and manage flows, review your received and sent approvals, and launch flows with the Flow Bot. In this post, we’ll walk you through these new capabilities. Let’s imagine that you’re the Chief Compliance Officer at the Legal department at Contoso Inc. (as most of you know, Contoso is the world’s largest imaginary corporation). 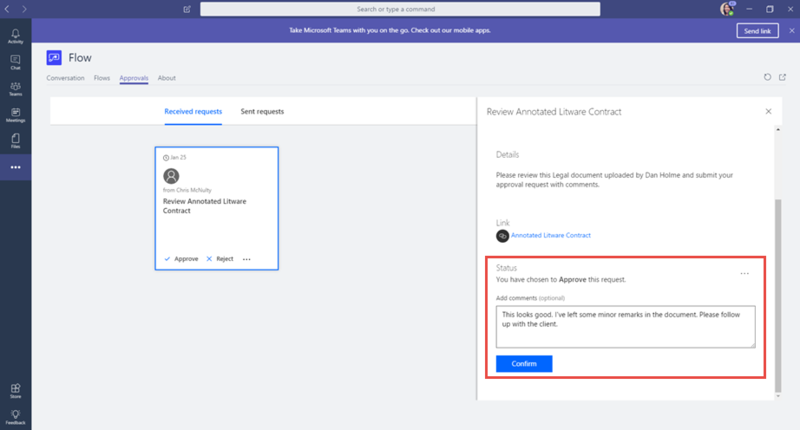 You want to send out an approval request whenever a new document is uploaded to the Legal folder in a SharePoint document library. 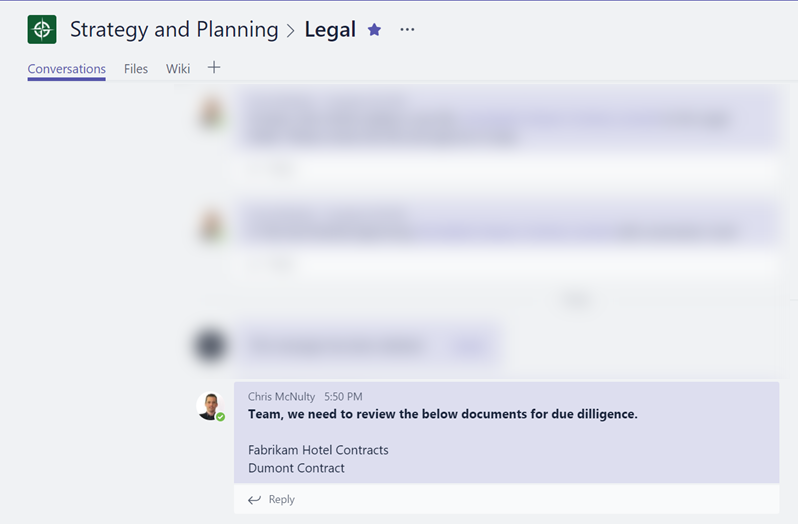 To inform approvers and ensure everyone has visibility into any feedback, you want to notify your teammates on Microsoft Teams. With the Flow integration in Teams, you can quickly create a flow and boost your team’s productivity. Let’s learn how. 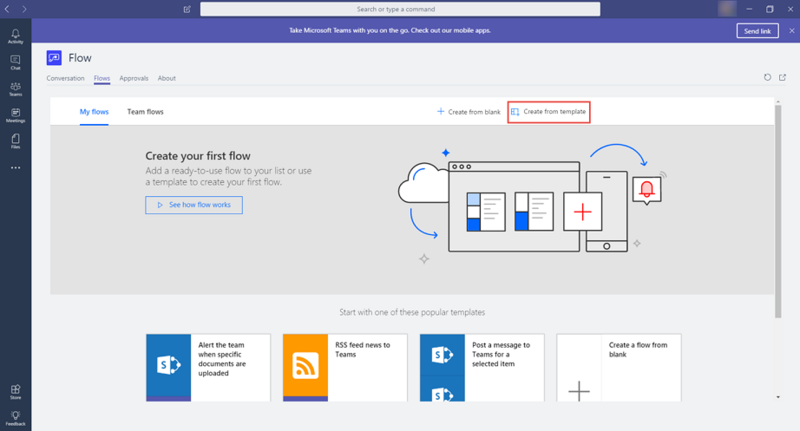 To get started, install the Flow app from the Teams’ Store. To access the Store, click on the icon at the bottom of the left-hand navigation bar. Then, choose the Flow app from Top picks or type "Flow" in the search box. Once you’ve installed the app, you’ll notice four tabs – Conversation, Flows, Approvals, and About. The Conversation tab enables you to interact with the FlowBot, the Flows tab allows you to create new flows and manage existing ones, and the Approvals tab lists your received and sent approval requests. Click on the Flow tab and Sign in. Then, click on the Create from template button. 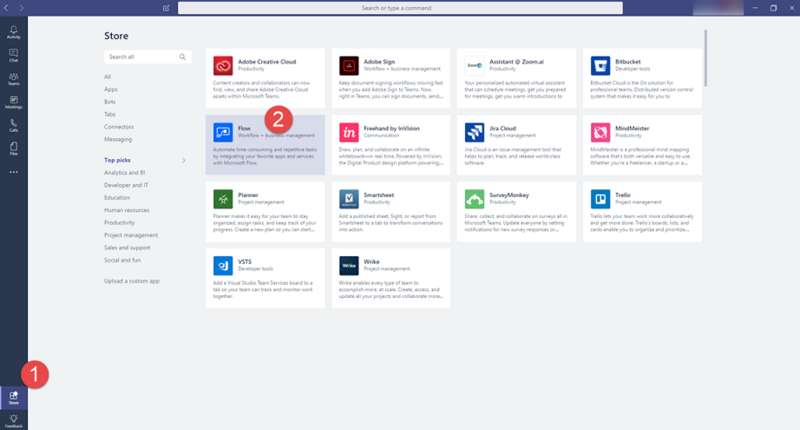 You can choose from several templates, connecting your Team to services like SharePoint, Microsoft Forms, Dynamics, Twitter, PowerBI, and UserVoice. 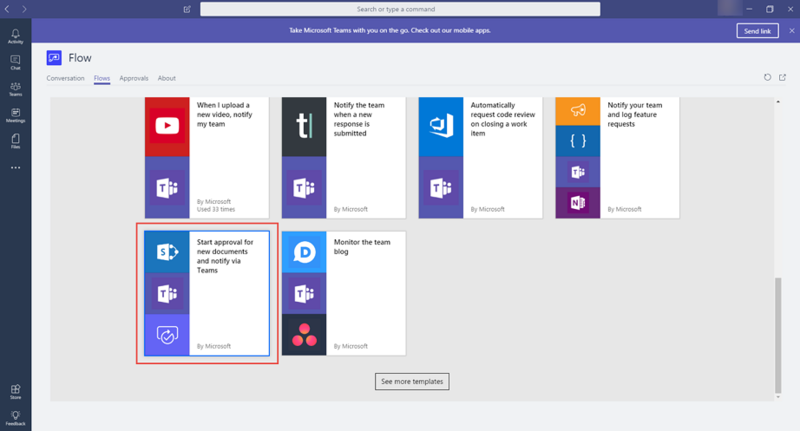 Select the template titled Start approval for new documents and notify via Teams. Clicking on the template, will open the Flow designer. 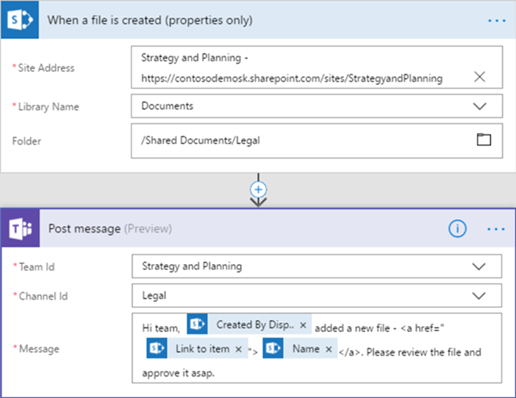 For the trigger, When a file is created, select the SharePoint site and library hosting the data for your team. For the Post message actions, select the Team and Channel for the Legal department. Finally, enter the names of your teammates for the Start approval action. Note – All of the SharePoint files triggers and actions are usable for your team’s file library as the underlying data source is SharePoint. Let’s see our flow in action. In the Legal channel, navigate to the Files tab and upload a new file. 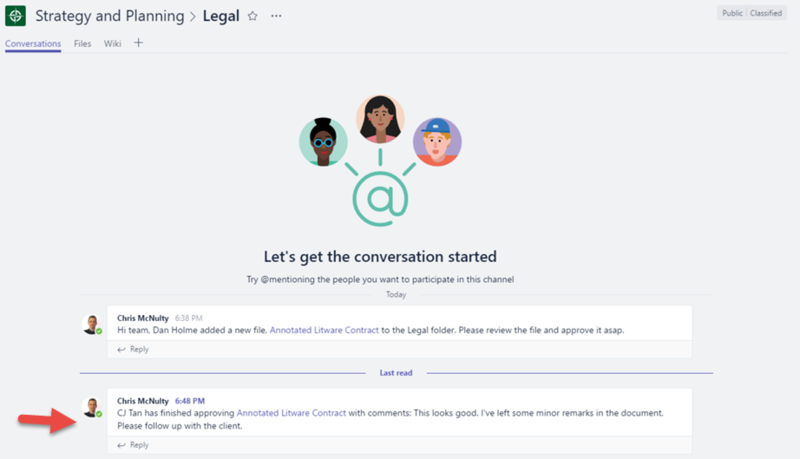 Notice that the Flow is immediately triggered and a message is posted in the Legal channel asking the team to approve the newly uploaded file. This message matches the values we entered while creating the flow. The message is posted on behalf of the flow creator. Click on the ellipsis to see your personal apps and switch to the Flow app. Now navigate to the Approvals tab. You’ll notice a pending approval for the newly uploaded file. Once you’ve reviewed the file, click on Approve or Reject, enter a comment, and click Confirm. Bam! A new message is posted to the Legal channel with details about the approver and his/her comments. The Flow integration in Teams also includes a Bot that enables you to run manual flows. Currently, this is limited to flows that run on a schedule, with support for all manual flows coming soon. 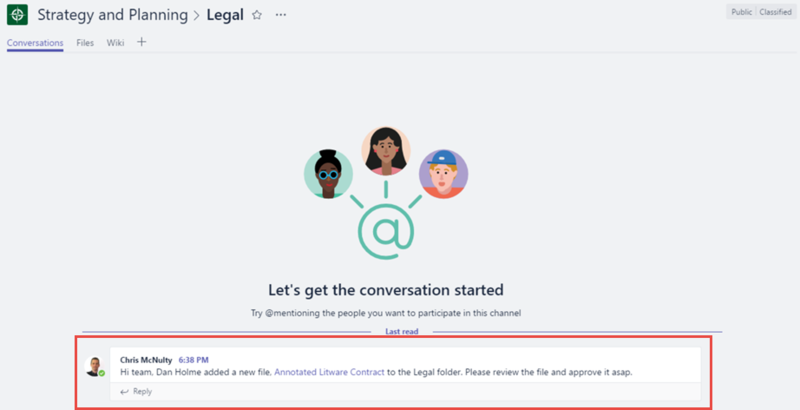 Continuing with our earlier example of the Legal department at Contoso, let’s imagine that we have a flow that runs daily and posts a message to the Team reminding everyone to review certain files for due diligence. You can check out this blog post on how to create such a flow. Using the Flow bot, we can run this flow immediately. Head over to the Conversation tab. To see the list of flows you can run, enter the command List flows. Once you get back a list of flows, enter the command run flow followed by the index of the flow you want to run. For example, run flow 1. You’ll notice the Flow immediately runs and posts a message in the Legal channel. We see our integration in Teams as just the beginning of a long journey in making you and your team more productive. We’d like to seek your help in shaping the roadmap, so please leave us suggestions below and post on our Ideas forum. We hope you enjoy this new update and stay tuned for more!